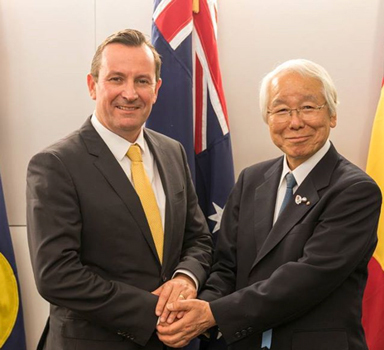 Premier and State Development, Jobs and Trade Minister Mark McGowan met the Governor of Hyogo Prefecture on April 24th to celebrate the 35th anniversary of the Sister State relationship. Together, Mr McGowan and Governor Toshizo Ido signed a fresh agreement re-affirming the two parties’ ongoing commitment to the relationship. Established in 1981, WA’s friendship with Hyogo is the State’s oldest Sister State relationship, with 2016-17 marking its 35th anniversary. Governor Ido was joined in Western Australia by a delegation of more than 60 people, including representatives from the political, environmental, aquaculture and tourism sectors. During their visit, members of the Hyogo delegation travelled to Albany and Margaret River, met representatives of the Western Australian Parliament, toured the Australian Marine Complex, took part in a tourism seminar and visited Curtin University. A number of events have already taken place to celebrate the 35th anniversary, including the Western Australian Youth Orchestra’s successful tour of the Hyogo Prefecture in December 2016. The Western Australian Government has maintained a trade and investment office in Kobe, Hyogo, since 1989.